This article is about the golfer. For the Luftwaffe general, see Walter Hagen (aviator). Hagen won the U.S. Open twice, and in 1922 he became the first native-born American to win the British Open, and won the Claret Jug three more times. He also won the PGA Championship a record-tying five times (all in match play), and the Western Open five times when it had near-major championship status. Hagen totaled 45 PGA wins in his career, and was a six-time Ryder Cup captain. The Masters Tournament, the newest major, was established in 1934, after his prime. Born in Rochester, New York, Hagen came from a working-class family of German descent. His parents were William and Louisa (Boelke) Hagen, his father worked as a millwright and blacksmith in Rochester's railroad-car shops. Walter was the second of William and Louisa's five children and the only son. Hagen developed his golf game at the Country Club of Rochester, beginning as a caddie, and earned money to help support his family from pre-teen age. He earned ten cents per round and was occasionally tipped another five cents. Hagen played golf at every chance he got; caddie access to the course was limited to off-peak times, as it was elsewhere in the U.S. during that era. 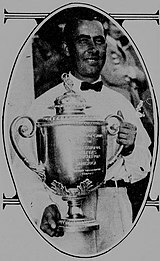 Hagen, with assistance from head professional Alfred Ricketts, gradually improved his golf skill to the stage where he was an expert player by his mid-teens, and was then hired by the club to give lessons to club members and to work in the pro shop. He made his top-class professional debut at age 19 at the 1912 Canadian Open, placing 11th, a good showing. Hagen followed up with a surprise 4th place showing at the 1913 U.S. Open at Brookline where he stated that he was treated badly by the other professionals who knew nothing about him. Hagen said "they pushed me off the tee and told me I could practice when they were through". He vowed to play in the 1914 U.S. Open and "win it", and he did exactly that. Hagen was also very skilled at baseball, primarily as a pitcher and shortstop. He canceled a 1914 tryout for the Philadelphia Phillies in order to play in a golf tournament. Later that week, Hagen was the U.S. Open Champion, and his career was changed forever. 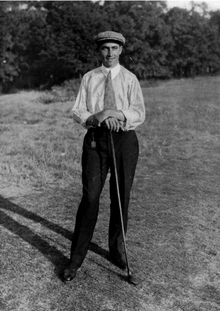 Hagen was a key figure in the development of professional golf. He emerged in an era when the division between amateurs and professionals was often stark, with the amateurs having the upper hand in some sports, golf among them. This was especially true in the United Kingdom, which was the leading country in competitive golf when Hagen began his career. Golf professionals were not allowed to partake of the facilities of the clubhouse, and were not allowed to enter the clubhouse by the front door. On one occasion, at the 1920 British Open in Deal, Kent, Hagen hired a Pierce-Arrow car to serve as his private dressing room, because he was refused entrance to the clubhouse dressing room. He hired a chauffeur, and parked the expensive car in the club's driveway; this behavior raised a few eyebrows in class-conscious Britain. On another occasion, he refused to enter a clubhouse to claim his prize because he had earlier been denied entrance. The 1920 U.S. Open in Toledo marked a turning point; the players, encouraged by Hagen, donated a large grandfather clock to the host Inverness Club, in appreciation of the club allowing access for the professionals to their clubhouse during the tournament. Hagen was a dashing and assertive character who raised the status of professional golfers and improved their earnings as well. Throughout his career, he played hundreds of exhibition matches, all across the United States and around the world; these tours popularized golf to an immense degree. Hagen was also widely known for his dashing wardrobe while playing; this featured expensive tailored clothes in bright colors and plush fabrics. As one of the world's top players, Hagen found his skills were much in demand with this exhibition format, and concluded it was much more lucrative than playing most tournaments. Hagen also made significant money endorsing golf equipment, and played a major role in helping to design clubs for Wilson Sports, which bore his name (either "Walter Hagen" or "Haig Ultra"). His work with Wilson produced some of the first matched sets of irons, around the same time that his great rival Bobby Jones was performing similar work for the Spalding company. The improved equipment expanded golf's appeal, brought high-quality clubs within the price range of many more players, and raised the standard of play. Hagen may have been the first sportsman to earn a million dollars in his career. He once stated that he "never wanted to be a millionaire, just to live like one". Hagen once expressed his creed in these words: "Don't hurry, don't worry, you're only here for a short visit, so be sure to smell the flowers along the way." Gene Sarazen, who was ten years Hagen's junior commented, "All the professionals ... should say a silent thanks to Walter Hagen each time they stretch a check between their fingers. It was Walter who made professional golf what it is." On the notion of golf as a financial endeavor, Hagen wrote in his autobiography, "My game was my business and as a business it demanded constant playing in the championship bracket, for a current title was my selling commodity." Hagen battled throat cancer for over four years and had several operations. Two years before his death, he was honored with a testimonial dinner in August 1967 in Traverse City, Michigan, attended by major champions Arnold Palmer and Cary Middlecoff. A month earlier at the PGA Championship in Colorado, he admitted to being a fan of Palmer's, a member of "Arnie's Army." Hagen died in 1969 at age 76 at his home in Traverse City, and now rests at the Holy Sepulchre Mausoleum in Southfield, Michigan, next to his grandson. His pall bearers included Palmer. In 2000, Hagen was ranked as the seventh greatest golfer of all time by Golf Digest magazine. Hagen was ranked as the eighth greatest player of all time by Sports Illustrated / Golf Magazine in a major 2010 ranking. There is some debate among golf historians as to whether Hagen should actually be credited with 16 major championships, second only to Jack Nicklaus and one ahead of Tiger Woods. (However, counting the U.S. Amateur, which is no longer considered a major championship, Woods's three Amateurs titles gives him a total of 17, three behind Nicklaus's 20.) 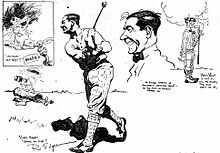 Hagen captured the Western Open five times (1916, '21, '26, '27, and '32), at a time when the Western Open was considered one of the premier events on the world golf schedule, second only to the U.S. and British Opens. The concept of the "four modern majors" was not precisely initiated until Arnold Palmer's Masters and U.S. Open wins in 1960; Palmer stated his intent at that time of going for a modern Grand Slam by winning the Open Championship and the PGA Championship that same year; this was taken up by the world's golf media, and has gained increasing credence with time. In Hagen's prime, the Masters had not yet been founded, and the Western Open (the championship of the Western Golf Association) was, by today's definition, a "major", insofar as it was one of four elite tournaments in which most of the top golfers in the world could be counted on to participate each year. Hagen captained the United States in the first six Ryder Cups, and played on the first five U.S. teams: 1927, 1929, 1931, 1933, and 1935. Hagen has been inducted into the World Golf Hall of Fame, in the charter class of 1974. Hagen has been portrayed by Bruce McGill in the 2001 movie The Legend of Bagger Vance, and by British actor Jeremy Northam in the 2004 Bobby Jones biopic Bobby Jones: Stroke of Genius. ^ a b c "Walter Hagen dies". Nashua Telegraph. New Hampshire. Associated Press. October 6, 1969. p. 16. ^ Auclair, T.J. (August 12, 2018). "15 Greatest Golfers of All Time". PGA of America. Retrieved August 25, 2018. ^ "1922 Walter Hagen". The Open. Archived from the original on November 26, 2011. Retrieved October 16, 2013. ^ a b Great Athletes. 11. Salem Press. 2009. ^ "Through Half a Century – Commemorating the Fiftieth Anniversary of the Founding of The Country Club of Rochester" (PDF). p. 21. ^ Grimsley, Will (August 7, 1980). "Pros toast Walter Hagen". Sumter Daily Item. South Carolina. Associated Press. p. 2B. ^ "St. Petersburg Times". St. Petersburg Times. March 21, 1924. ^ "St. Petersburg Times". St. Petersburg Times. November 14, 1924. ^ "Walter Hagen winning biggest bout of life". Lawrence Journal-World. Kansas. Associated Press. July 29, 1965. p. 9. ^ "Walter Hagen testimonial attended by 250 persons". Lawrence Journal-World. Kansas. Associated Press. August 15, 1967. p. 9. ^ Grimsley, Will (July 22, 1967). "Walter Hagen is member of Arnie Palmer's Army". Free Lance-Star. Fredericksburg, Virginia. Associated Press. p. 7. ^ "Hagen's burial will mark end of a legend". St. Petersburg Times. Florida. Associated Press. October 7, 1969. p. 1C. ^ "Arnie to return". Owosso Argus-Press. Michigan. Associated Press. October 10, 1969. p. 15. ^ Yocom, Guy (July 2000). "50 Greatest Golfers of All Time: And What They Taught Us". Golf Digest. Archived from the original on May 27, 2012. Retrieved December 5, 2007. Clavin, Tom (2005). Sir Walter: Walter Hagen and the Invention of Professional Golf. New York: Simon & Schuster. ISBN 978-0-7432-0486-6. Frost, Mark (November 3, 2004). The Grand Slam: Bobby Jones, America, and the Story of Golf. Hyperion. ISBN 978-1-4013-0108-8. Hagen, Walter; Heck, Margaret Seaton (November 2004) . The Walter Hagen Story: By the Haig, Himself. Ann Arbor, Michigan: Sports Media Group. ISBN 978-1-58726-131-2. OCLC 57312685. Lowe, Stephen R. (August 30, 2004) . 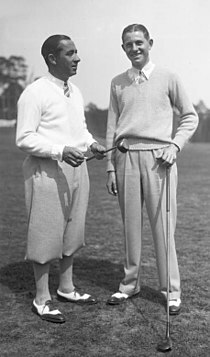 Sir Walter and Mr. Jones: Walter Hagen, Bobby Jones, and the Rise Of American Golf. Sports Media Group. ISBN 978-1-58726-187-9. Rapoport, Ron (March 16, 2005). The Immortal Bobby: Bobby Jones and the Golden Age of Golf. Hoboken, New Jersey: John Wiley & Sons. ISBN 978-0-471-47372-5. Sampson, Curt (1992). The Eternal Summer: Palmer, Nicklaus, and Hogan in 1960, Golf's Golden Year. Dallas: Taylor Publishing. ISBN 978-0-87833-788-0. OCLC 25025891.